Mustang interior restoration, in my mind is one of the easier parts of restoration and ranks only in satisfaction with first seeing your newly painted car roll out of the paint shop. Below, we'll look at the most common do-it-yourself classic Ford Mustang restoration projects. They're a great way to get started on your project. And I'll provide direct links throughout these sections to much more detailed information on the site to get you through your project. The order that you do your Mustang interior restoration process may be different than mine, but the areas that need to be restored, will likely be the same. Here are some common parts of the car, that often need to be replaced or restored to their original brilliance. Installing new new carpet and replacing sound deadening materials not only drastically improves the look of your car's interior, it also goes a long way to getting rid of the "old car smell" you've been putting up with. If you're lucky, you can get away with no more than cleaning up the dash with a little soap and water. For most of us however, it takes more than that. At the far end, you may need to completely replace the original pony car dash with an aftermarket dashboard pad which may be cracked from years in the sunshine. The cost of a new one, depending on the year of your little Ford can range from as little as a $100 plastic dash pad cover, to over $300 for a later model OEM quality reproduction dash. If it just looks tired, the process is much simpler and cheaper. I was lucky. From 25 years of inside storage, my dash was dirty, ugly and couldn't be scrubbed clean. But it was still in one piece, meaning with some time and some vinyl dye, there was still hope for it. Of course, there's more to the dash and instrument panel than just this piece, meaning there's a bit more to do to get the whole assembly looking like new. But all of this is something you can accomplish yourself, with a basic socket set, and the will to make it happen. The dash restoration section explains in detail how to bring it back to like-new condition. 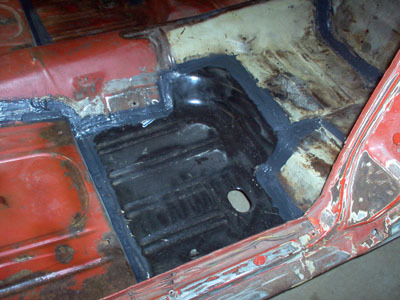 That of course reminded me, that cutting out rusted floors and replacing them with new floor pans or just replacing smaller areas using partial floor panels is something that most of us who are restoring a classic 'Stang have to do at some point of your Mustang interior restoration. Even if you don't plan on replacing the floor pan or doing the panels yourself, it's a good idea to know what the process is, so you can make an educated choice when you find a shop to do your Mustang interior restoration for you. 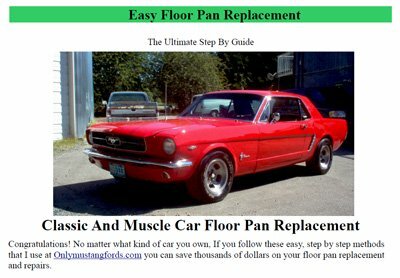 Here's the link to Mustang floor pan replacement. Every time I take on a new project, I end up learning things I didn't even want to know. There are two full sections devoted to floor pan replacement. Since it's almost a universal rite of passage for pony car restorers and enthusiasts, there's a lot of detail and tips. Even More Floor Pan Replacement Info To Come ! As I created this section, I realized I could probably devote an entire site to just the repair and replacement of Mustang floor pans. There's only so much you can read and see before tackling your own project so in the next month or so, I'll be making available an in depth, downloadable e-book, showing you step by step, how to easily fix or replace floor pans and save a boat load of cash, whether or not you can weld. 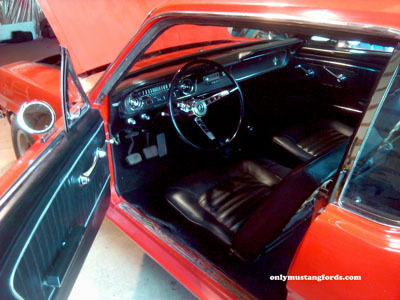 Mustang door panel replacement is common on classic cars, whether you have a standard interior or a pony interior. With later cars, chances are, you might still need to know how to remove a door panel to install speakers or repair electrical problems. 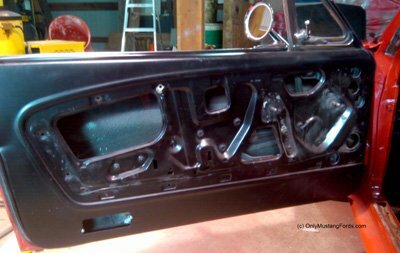 Part 1: shows you how to remove and replace classic Mustang door panels for 1964 1/2, 1965,1966,1967,1968,1969 and 1970 cars. Jump to Part 1 door panel removal. Part 2: covers 1971,1972,1973 Mustang door panel removal and replacement. 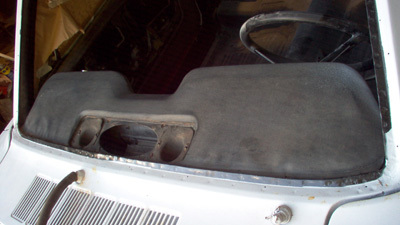 Jump to Part 2 for 1971 to 1972 door panel removal . Part 3: In this section, you'll learn how to remove door panels for 1994,1995,1996,1997,1998,1999,2000,2001,2002,2003 and 2004 Mustang vehicles. Click the link for the complete removal procedure. Part 4: is for the new Mustang and covers the 2005 model specifically, and although I haven't tried it yet on the 2006,2007,2008,2009 and 2010 cars, they have basically the same doors, so it should work here too. Click the link for the removal process for fifth generation Mustangs. What do you do with those nasty looking interior rear quarter panels? Well if you're half way serious about your Mustang interior restoration here's what you can do. Well, you have two possibilities and neither are a very big job. 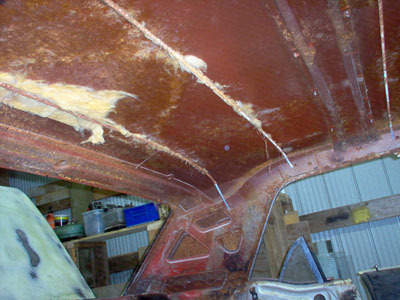 It all depends on the condition of the existing interior panels. Replacing the interior quarter panels requires only minimal mechanical skill, some basic tools and a an hour or so of your time. I'll soon post a link on replacing interior quarter panels. This option is simple and fast. To make a professional looking result isn't difficult, but it does mean doing the proper preparation. Follow the link and you'll see how to restore your interior quarter panels with vinyl dye. Headliner replacement is also pretty common. When I bought my project, I thought I wouldn't have to replace the headliner,but on closer inspection, I found 2 nice little mouse holes, that couldn't be repaired (thankfully there were not any carcasses still in there). But if you need to know how to replace a Ford Mustang headliner, here's the direct link to the full headliner replacement section. 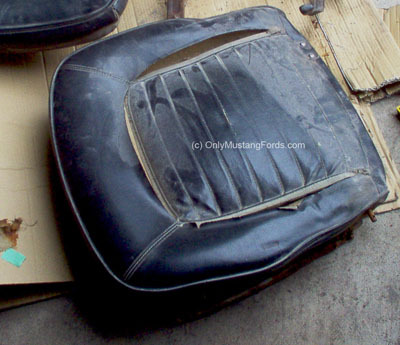 Replacing or if you're lucky just repairing your Stang's seat covers is an almost universal project for any Mustang restoration. What does it take to replace a seat cover? A little money, several hours and a $10 dollar tool for those weird little circular clips called "Hog Rings" that hold them to the seat frames. Add some sandpaper, a wire brush, some spray on lubricant and a rattle can of touch up paint and you can have them looking and rolling like new! Stay tuned for the step by step procedure - Coming Soon!